GENERAL QUESTIONS - See Frequently Asked Questions (pdf) for answers. 1. How did you choose your name? 2. Why do you meet at Gethsemane Lutheran Church? 3. Why is it important to call yourselves "Roman" Catholic, and not just Catholic? Or why not just become Episcopalian or Protestant? 4. What is your relationship to the canonical church (Diocese of San Diego and the Vatican)? Why are you not recognized by them? See also How We are Different. 5. How do we join the community and become members? 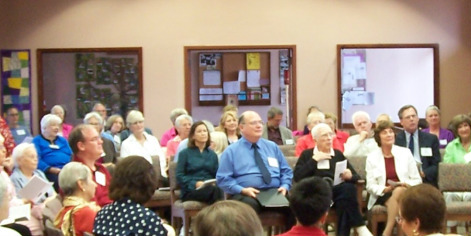 Can we worship at MMACC and a diocesan parish? See also Membership. QUESTIONS REGARDING THE LITURGY - See Frequently Asked Questions (pdf) and Inclusive Language for answers. 6. Why do you use language about God that is different from the "traditional" language? 7. Why don't you just say "he" for God? What's wrong with "Lord?" 8. Why are the readings sometimes different from the Revised Common Lectionary used in other churches? 9. Why do you use a different creed after the homily and not the Nicene or Apostles' Creed? 10. Why does the Assembly participate in the Eucharistic Prayer and say aloud the words of the Consecration? 11. Why are other languages sometimes used during the Eucharistic Prayer? 12. Why is the language of the "Our Father" different from what I know/grew up with? 13. Why are there options for grape juice and gluten free bread at Communion?